A great time reading with great readers. 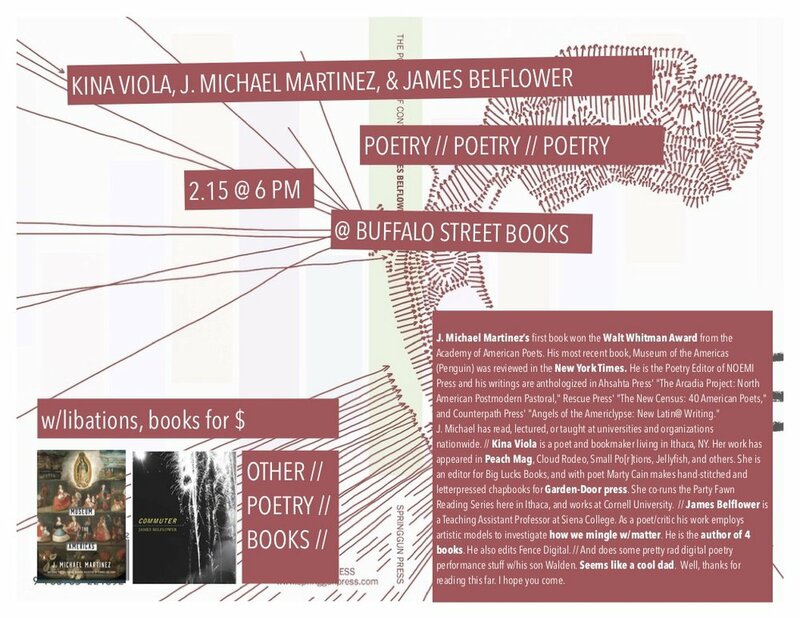 Thanks to our host Joe Hall and Buffalo Street Books! Thanks to Kina Viola and J. Michael Martinez. Audio of my performance of a new work for text and electronics titled Techniques for the Oddity. I’ll be in Ithaca performing a new piece for electronics and text titled Techniques for the Oddity. Hope to see you there! Just uploaded audio from the 4th set of the Canyons reading tour. Enjoy! The Canyons tour ended its first phase in Iowa City at Performance Space one, hosted by John Éngelbrecht. It was a lovely night. The performance artist Jillian Weise screened pointedly political videos of her alter ego Tipsy Tullivan, and poet Raj Chakrapani read from a new work that blended poetry with voice-overs of prominent public figures. Matthew and I played a longer set than previous readings and we enjoyed plugging into PS1's sound system for two reasons. One, we didn't have to lug all our equipment in and out! Two, it was vastly superior! I'll post audio of this performance over the weekend so check back soon! We are in Providence toward the end of October, so if you're in the area we hope to see you. The rest of our tour schedule is available here. Another amazing evening on the Canyons tour! After a few too many coffees Matthew and I landed in Chicago for our 3rd performance at the Experimental Sound Studio. Anne Shaw and Toby Altman hosted us at Absinthe and Zygote an innovative performance series that changes locations for each event, from dark rooms, to crowded elevators, to hair salons. In front of the welcoming pink baffle backdrop of the Experimental Sound Studio it was a night of multimedia projections, polyvocality, and hilarious characters. We opened our set with "Welcome to Colorado" and sonically constructed an environment in which the "pure products of America go crazy." Little did we know how well that would resonate with the other performers. Poet and playwright Kate Morris read next, projecting maplike watercolor images in the corner of the room. She was followed by Olivia Lilley, whose comparisons of dating life to The Lord of the Rings had everyone cracking up. Olivia Cronk's reading of Louise and Louise and Louise ended the evening, quickly switching through the voices of a slew of characters, inhabiting each deftly. We read in Iowa City on the 10th, and will pick up the tour again on October 22nd in Providence. Hope to see you there! We just arrived home yesterday so audio of the tour will be posted soon! 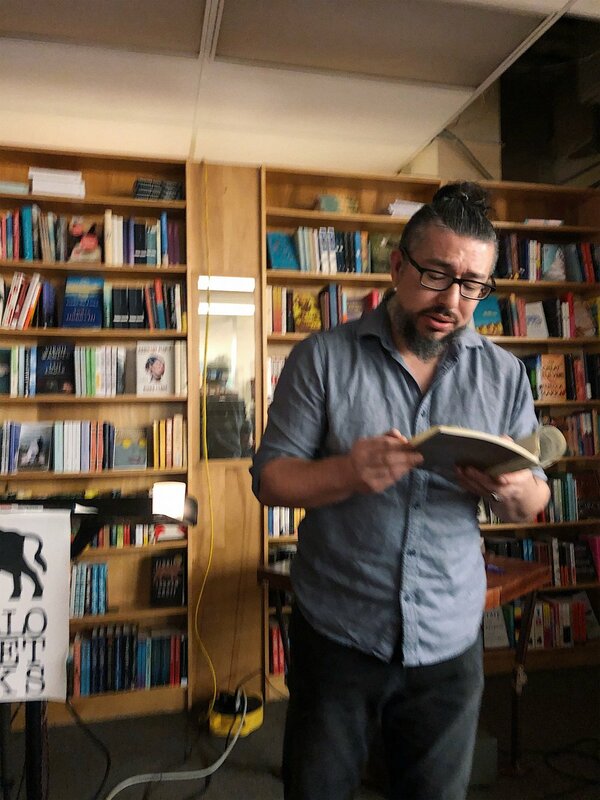 We had a great night at the exceptional Woodland Pattern bookstore in Milwaukee Friday night. Host, Michael Wendt, introduced the performance. We altered the Canyons set list starting with a prickly soundscape that descended into the haunting sequence "Welcome to Coloroado," interspersed with found sounds from a Buffalo reserve I toured in 2014, & finishing with the final disquieting sequence "The Vanishing Savages'." We had a great conversation over new music with poet Paul Vogel & spent the drive to Chicago the next day blasting Seapunk & Witchhouse. Really digging Blank Banshee & Salem. I'll be posting audio of the show as soon as we return.